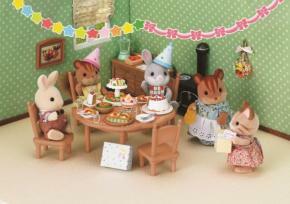 The Woolly Alpacas are new to Sylvania, and are some of the most creative, craftiest Sylvanians around! They have the softest yarn which they take great pride in, and wear clothes in a gorgeous vintage style. Andre can knit the warmest, cosiest garments out of the most beautifully coloured yarn. He sometimes spends so long poring over the samples, that Ariana wonders where he is. Ariana is Andre’s beautiful wife with a singing voice to match. Her favourite season is winter and she practices Christmas carols all year long to sing to her neighbours. She also loves to wrap up warm in Andre’s cosy knitwear. Just like her parents, Fiorella is imaginative and artistic. You’ll usually find her creating something beautiful. Recently she has taken to embroidery and adds beautiful details to all of her clothes. Her latest project is with her father - they're making a beautiful scarf for her mother, which Fiorella will decorate with delicate embroidery. Gabriel is the youngest of the Woolly Alpacas and, although he is the smallest, he certainly has the biggest smile. He loves the colour green and exploring the meadow is his favourite thing to do. 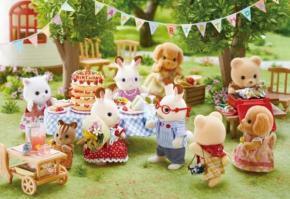 Calling all Sylvanian Families fans! We’re holding a very special event for our Premium Fan Club members – you’re invited for Bank Holiday Fun with Sylvanian Families on the 25th May. The exciting event will take place at the Mercure Leicester, Granby Street, Leicester. There are all sorts of exciting things in store at the event, for our tip-top fans! Meet and greet your favourite Sylvanians in real life, like Katherine Marshmallow, and even have your photo taken with them for a lovely keepsake. You can relax in front of the big screen with episodes of the Sylvanian Families Netflix show, get crafty in the arts and crafts corner, play some Sylvanian themed party games or dance along to the mascot performances, performed throughout the day. 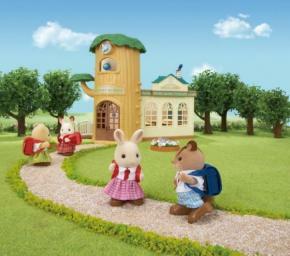 On top of all that, an exclusive opportunity to play with some of the newest Sylvanian Families products should be enough to get any Sylvanian lover excited. The brand new Autumn/Winter range will also be available for purchase, so keen collectors can get their paws on the exciting new sets before anyone else! If you would like to come along and meet some other Sylvanian super-fans, tickets are available from EventBrite but they are limited, so don’t wait around! Tickets are completely free for Premium Fan Club members and there will be exciting goodie bags brimming with Sylvanian surprises for everyone to take home. Not a premium member but desperate to come along? There’s still time! Members who sign up to the Fan Club before 11th May are still eligible for a ticket. The all-day event will start at 10:30am and finish at 4pm, with mascot performances at 11am and 2pm, and meet and greets at 12:30 and 3:30pm. It’s Grandpa Chocolate’s birthday next week, and Mother Chocolate knows how much I adore crafts so has asked me to make the bunting especially for his surprise party. Will you give me a helping paw? You will? Oh, isn’t that wonderful! Now, let’s gather all the things we need to make the best birthday bunting you ever did see! - Brightly coloured markers or stick-on letters. You’ve chosen the prettiest colours here, Grandpa Chocolate will love them! This is what the bunting will be made of so we need to cut it into diamonds. Make sure you get some help from an adult when using the scissors, we don’t want any accidents now do we? To make the perfect diamond shape, from top to bottom should be about 20cm and it should be 10cm from side to side. When you’ve cut out enough paper diamonds (there are 13 letters in Happy Birthday, and don’t forget about the space!) fold them top corner to bottom, making sure the crease is nice and clean before unfolding each diamond and laying them flat on a table, side by side. Here is the best time to get creative, and arrange the different colours in a beautiful pattern! Next, take your string and lay it along the crease of the paper diamonds. This next step can get a bit messy, as it’s time to use some glue. Fold each diamond into a triangle once again, trapping the string in between and gluing down the flap. Now it’s time to decorate your home-made bunting! Grab your markers or letters and fill out your bunting with a birthday message. I can’t wait to hang this up for Grandpa Chocolate’s birthday, I hope he loves it! Hello buttercup, how wonderful to see you on this lovely day! The sun is shining and we’re going out to play, why don’t you come and join us? Mr. Petite brought in some chalk today, so we’re going to play hopscotch in the playground. Now, do you know how to play? First of all you have to draw the squares on the floor – the pattern goes one, then two, then one, then two all the way to the end, and there are eight all together. Each box needs a number, so start at the bottom and work your way up! Wow, it’s so neat! Now, who wants to go first? OK Tiffany, you’re up! Take this pebble and throw it onto square number one. What you have to do is collect the pebble whilst hopping along the board, and make it to the other end without stepping on the lines or outside of any of the boxes. Ready? Go! One foot, two feet, other foot, both feet! That’s the trick! Well done Tiffany. Who’s next? Jasper? Off you go! 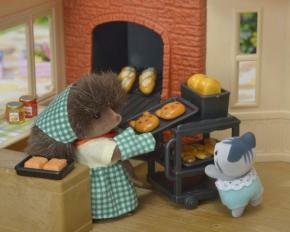 Wow, that was a quick one, you must have the fastest paws in Sylvania. Who wants to go next? Right, did everyone manage to get the pebble from number one? Fantastic, let’s try number two! Ralph, you go first this time… Oh dear! You stepped outside of a box! That means you don’t get your pebble this time, but don’t you worry, you can play again on number three. Once we get all the way to number eight, we’ll see who has the most pebbles and crown them the hopscotch champion of Sylvania. *Brrrrinnng* Oh no, that’s the school bell! We’ve run out of time, so we’ll just have to find out who’s the winner tomorrow. I do hope it’s still beautiful and sunny when we come out to play. 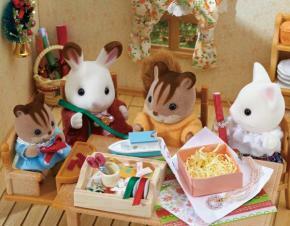 As every Sylvanian knows, breakfast is the most important meal of the day, setting you up for a day full of adventures! My most favourite breakfast treat is a cinnamon roll, hot and fresh from the oven. Just thinking about the delicious cinnamony smell is making my tummy rumble! I’m about to whip up a batch, so how would you like to lend a paw? Don’t forget your apron now! First things first, turn the oven on to 180°C/fan 160 °C/gas 4 and grease a 20 cm cake tin, then line it with baking parchment. Once you’ve measured out the flour, caster sugar and cinnamon, mix them all up in a bowl with a pinch of salt. Next, whisk the butter, egg yolks and milk together, then tip them into the flour mixture. Watch out for any splashes! Stir the mixture all up until it makes a lovely soft dough, as squishy as a trampoline! Now you’re ready to turn it out onto a floured surface and make it all nice and flat, with a rolling pin. Try to make sure it’s about 30 x 25 cm big so that it fits neatly into the cake tin. Now it’s time to make the yummy filling! Combine all the ingredients together until it’s nice and creamy, then spread it evenly all over the flat dough. Roll it up tight lengthways like a Swiss roll and cut it into 8 slices. Place all the sizes flat side down in the cake tin, brush gently with some milk and you’re ready to bake! Bake them for 30-35 minutes until they’re a golden brown colour. Once they’re done, carefully take them out the and let cool for 5 minutes, you don’t want to burn those paws. To finish off our pastries, we now just need to make the icing! Gently sift the icing sugar into a bowl to get rid of all the lumps and bumps, and make a little well in the centre. Place the cream cheese and butter into this hole, carefully pour over 2 tbsp boiling water to melt it and give it a good stir. You need quite a watery consistency so add a little water if it’s too thick. Lastly, add in the vanilla essence and then drizzle across your rolls. Now for the very best part - gobble them all up with a hot cup of acorn tea! The Baby Castle Nursery is the cutest nursery you ever did see! Sometimes the babies are having so much fun, they don’t want to leave and have to be coaxed away with a promise of a cookie and being able to come and play again tomorrow! 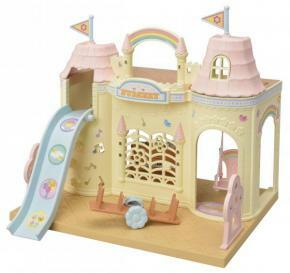 The castle shaped nursery has candy floss pink turrets, various flags and castle turret shaped windows, so you can pretend to princes and princesses overlooking your kingdom. Inside there are lots of fun things for the babies to entertain themselves with. They can touch the clouds on the cute swing, whoosh down the slide or enjoy a fun story-time with the books. Gather round the piano for a sing-song or have a go on the seesaw – just add the flower wheels to the bench to convert it, isn’t that clever? For even more adventures, you can connect it to the Baby Castle Playground and Baby Choo Choo Train. Get the Baby Castle Nursery HERE. Good morning to you, isn’t it a beautiful day? It’s a little chilly outside, but who doesn’t enjoy a brisk walk in the winter sunshine? I’m about to do just that and pop out to the local grocery market to fetch some ingredients for a home-made tomato soup. Speaking of which, did you hear the Grocery Market is up for sale? 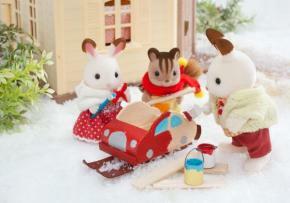 It’s perfect for all your Sylvanian shopping needs! It’s the sweetest little shop with a forest green roof and orange-striped canopies. You can even move the tills and food shelves around to have the layout exactly how you like it. Now, if you’re worrying about stocking up your shelves then there’s no need to fret, as it comes fully stocked with fresh fruit and vegetables, eggs, a few tins, milk, a variety of juice and cereals! With all that shopping, your customers may need a helping paw, so there are baskets and personal shopping bags to carry all their goodies. The check-out counter even has a working conveyor belt to slide their food into the bags, isn’t that clever? Don’t forget their points card when they pay! Now let’s see, what else can I show you? Oh yes! 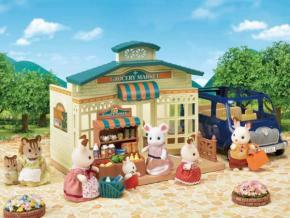 The whole building can be rearranged to create a lovely outdoor stand so your Sylvanians can see all you have to offer while walking past! It might be best to wait until the weather warms up though – you don’t want your strawberries getting chilly, now do you? Well, we’ve reached the end of the tour and I’m keen to hear what you think! So, will you take it? You will? That’s wonderful news! Why don’t you come with me to have a look around and we can discuss the details and warm up our paws over that soup. Hello dears! It’s so lovely to see you again, there’s nothing quite like a friendly face to warm you up on a chilly January morning! I must say, I love your outfit today; such a stylish get up. You must be turning all the heads in Town! So you’re looking for something even MORE elegant? Well, that’s a tough challenge considering how fabulous you look. What’s the occasion? Mother Chocolate’s birthday party? Goodness me, that is a very important event. Let me have a rummage in my wardrobe of goodies and I’ll see what I can find. Ooh there, yes! Here we go, what do you think of this Dress Up Duo Set? Now, there’s a small and a large dress, perfect for the most stylish pair in Town to twirl around in. They’re made of the silkiest fabric and come with matching handbags in complimentary colours - perfect for keeping all your belongings safe. Oh and look! I almost forgot, we even have a matching hat for each dress, beautifully finished with a silky chocolate brown bow. These two dresses really are the crème de la crème, do you think they fit the bill? Wonderful, I’ll pack them up for you to take away today. Now you just need to organise the party and a present for her! Christmas is just around the corner and I don’t know about you, but I still have lots of things to prepare! This year I’ve decided to make everyone their own little stocking, filled with the sweetest things to bring a smile to their face! Here I’ve made a list of some of the stocking fillers I’m going to get for some of my very closest family and friends - would you like to see it? First on my list is the Baby Band Series Surprise Pack! These sweet little blind bags all contain a baby figure with their favourite musical instrument. There are 8 figures to collect and the best thing is, they’re always a surprise! Maybe by Boxing Day we’ll have enough to make up a whole band! Next I need to get the Baby Sleigh Ride Set, with Milo Cakebread and Henry Periwinkle dressed up in the sweetest reindeer and Father Christmas outfits! They’re ready to give out presents to everyone in Sylvanian Village in their bright red sleigh, with their toy Sky Ride Adventure and teddy bear to keep them company. Let’s see, what’s next on my list? Oh yes! Christmas isn’t complete without some sweet treats, so I’m going to spoil everyone with the Chocolate Lounge! It comes with the prettiest chocolates in truly delicious flavours - my favourite is the chocolate and caramel truffle! Have you met the Maple Cat Family yet? They’re a very friendly bunch and you can usually find them in the Town, where Theodore drives the tram and Georgina owns the Creamy Gelato Shop. I’ve saved one of my very favourite presents until last - a membership to the Sylvanian Families Fan Club! 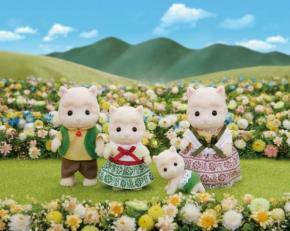 Everyone will love finding out all the latest news from Sylvanian Village, with four quarterly magazines, a yearly birthday card and certificate. It also comes with a unique Stella or Tiffany figure, those girls really are rather stylish! Well, I must be off to go get the rest of my things! It was splendid to catch up and I hope you have a wonderful Christmas! Hello there, little holly berry! It’s a little chilly, isn’t it? I’ve been keeping warm this winter with all sorts of crafting and making! Did you hear it’s going to snow next week? I’m super excited, as sledging is one of my favourite things to do in the winter. In fact, I’m about to make my very own sledge from things I’ve found around the house, so how would you like to lend a paw? Follow me on through to my workshop and we can get started! Now, here are the things I’ve found to make my very own sledge. As you can see, I have a thick cardboard box - the thicker the better for this! I also have a very large, thick plastic bag which will help the sledge slip and slide along the snow. And for the final touches, here is some very strong cloth tape and a pair of scissors. First things first, we need to open up the bottom of the box and cut off the short cardboard flaps so that we can squash it down nice and flat. *squish squish squish! * Remember to make sure the sides are folded inwards rather than outwards. Next, choose which side will be the front then fold up the top flap and tape it down, nice and sturdily. Now we can stick down the bottom flap too, at a 45o angle. That’s it! It needs to be all secure so that the sled glides over the snow, whoosh! I always put some extra tape around the sides to make sure it keeps it shape. Finally, let’s cut open this plastic bag and wrap up the sledge like a Christmas present! It might not look very pretty but this will help it slip and slide down those hills. Use plenty of tape to make sure it’s tough enough! Isn’t it wonderful to step back and admire something you’ve made with your own two paws? I can’t wait to try it out – now we just need to snow to hurry up and come fluttering down!